NEW Release LURE v2 fitmesh short dress. Do you dare with it ?? A new version with see through lace available in Black, White, Silver, Ruby, Yellow and Mustard; Fitmesh in 5 standard sizes and for bodies Maitreya, Slink and Hourglass. So romantic…..delicate…..feminine…Soft lace caressing your skin…. Admire the wonderful lace fabric in this original set of lingerie mesh, in 5 standard sizes. Apply advanced light model to see materials effect. Available in 6 beautiful single colors and also the Fat pack with texture hud. Again this year has arrived PENUMBRA!! GLITTER introduces 2 Exclusives for Spring Summer 2016. An awesome gown…MAJESTIC in 4 wonderful colors with amazing pattern and lower part in black lace which you can remove and transform in a lovely cocktail dress. This curve hugging mermaid gown is a most luscious shade of red, topped with sequins and fanned out with ruffles. This a stunning piece for an equally stunning woman. Make your fashionable entrance with this Majestic gown. 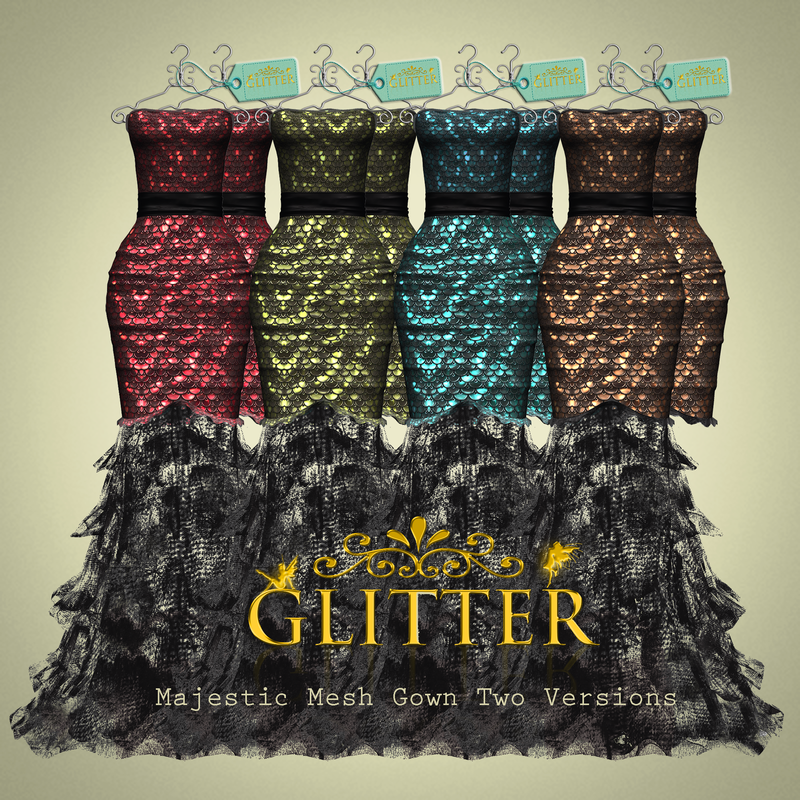 Between one event and another coming soon I repropose at Glitter’s new mainstore this really awesome complete outfit. Cocktail or party elegant dress patterned with cocodrile theme completed with a clutch you can match perfectly with your dress thanks to a texture hud in 6 colours!!! Two rings, earings and jewel on tigh are included. Optionally you can wear laced stockings.